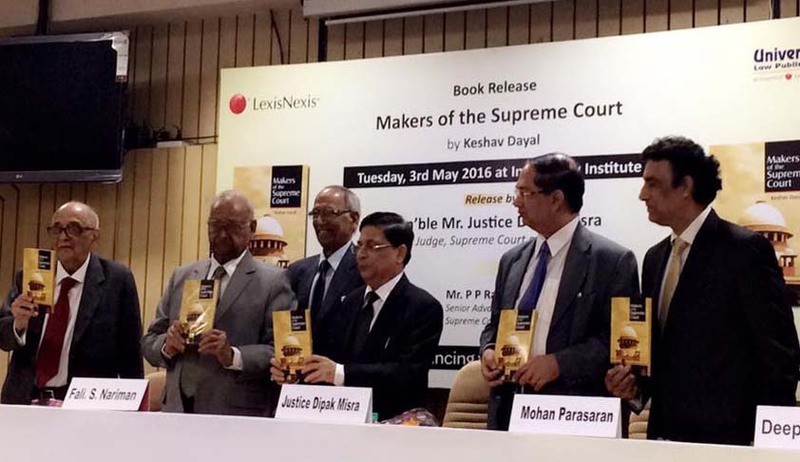 At a well-attended function at Indian Law Institute on 3rd May, Justice Dipak Misra released the book, “Makers of the Supreme Court”, authored by Keshav Dayal, and published by Universal Law Publishing Company, an imprint of LexisNexis. Speaking on the occasion, Justice Dipak Misra said a man can live without water for seven days, without air for one or two minutes, but if he is not praised, he may die in a few seconds. Justice Dipak Misra’s observation followed the praise heaped on him by the other speakers at the function. Recalling an event from his days as an advocate, Justice Dipak Misra said that he once obtained a favourable order from a Judge, when it was brought to the judge’s knowledge that Justice Misra was about to get married in a week’s time. Fali S Nariman, another speaker at the event, praised Justice Dipak Misra for his ‘judgecraft’. Explaining what is Justice Misra’s judgecraft, Nariman said, while the general practice among the Judges is to ask the counsel how much time they would take to make their submissions in a case, Justice Dipak Misra, in the recent challenge to the imposition of President’s rule in Uttarakhand, came prepared with specific questions, imposed a time-limit among the counsel to answer those questions, and even fixed 13 May as the date when the bench comprising himself and Justice Shiva Kirti Singh would deliver the judgment, before the court breaks for summer vacation. This, Nariman suggested, is not only unprecedented, but innovative. This is a precedent to be emulated by other Judges, he said. Senior advocate, Mohan Parasaran, observed that in Justice Dipak Misra’s court, one found not only humour, but a great level of intellectual deliberation. Senior advocate, PP Rao, said while remembering the makers of the Supreme Court, one should not forget the ‘unmakers’ as he put it. He then questioned where the current Supreme Court is headed, by taking up causes like vehicle pollution and forest wealth. Can the Supreme Court do justice in these matters, because it does not have the expertise, he asked. Rao’s veiled criticism of the Chief Justice of India, T.S.Thakur-led bench, which delivered the recent order in the vehicle pollution matter, disallowing diesel cabs in Delhi, in the presence of Justice Dipak Misra, was a bold one. The speakers generally recalled the wit of yesteryears by the doyens of the legal profession in the Supreme Court and in the high courts, and implicitly regretted that they miss it in the contemporary higher courts.